With worldwide demand for lithium showing no signs of slowing, a cost-effective and abundant supply to a growing market could set up a small cap mining play for many years to come. The state of Nevada, USA presents fertile ground for lithium and today’s ASX listed company is hoping to share in the spoils, with its advanced lithium JORC resource and an added boron kicker. Today’s company has one of the largest lithium and boron deposits in the US and it doesn’t see the need to limit its production to one mineral. It is looking to mine both resources. Actually, two co-products which currently attract a comparable high value. Its resource is just 340km from the Tesla Gigafactory – making it one of the world’s most geographically attractive projects. If this company can execute its plan to produce both lithium and boron cost effectively, and if current estimations about resource expansion prove accurate, the company could have its day in the Nevada sun. It already has a JORC-compliant Maiden Resource for its main project site in its pocket, with the Resource containing 3.4 million tonnes of lithium carbonate and 11.3 million tonnes of boric acid, which fetches US$750 to $1250 per tonne. Interestingly, 1% of boron converts to 5.7% boric acid, so boron is an important part of this company’s play. The project currently has a potential mine life of 20 years, which, taking current estimations into account means it could be producing 20,000 tonnes of lithium carbonate per annum. That is approximately 10% of world demand, along with 200,000 tonnes of boric acid, which also constitutes about 10% of global demand. One point of different here is that this $75M company isn’t another brine, clay or pegmatite lithium developer. It is a high-grade lithium-boron searlesite play – searlesite being an acid leachable silicate mineral that contains both lithium and boron, making both easier to extract. Searlesite has the potential to be more cost effective with the use of acid leaching rather than roasting to extract the metals, which would generally be required for lithium clay and spodumene (pegmatite) deposits. This company’s resource also features a high-grade Li-B zone referred to as the Searlesite Zone which comprises 65Mt at 1.0% Li 2 CO 3 and 9.1% H 3 BO 3 for a total of 650,000 tonnes of lithium carbonate and 5.9 million tonnes of boric acid – sufficient material to support a 3Mtpa mining operation over 20 years. A fully funded PFS is due to kick off in early 2017 – which is not too far away now. Previous exploratory legwork undertaken by other companies in the same area should enable a fast-tracking of the development of the project to BFS stage. Furthermore, this company recently began a drill program at its Rhyolite Ridge lithium-boron project. 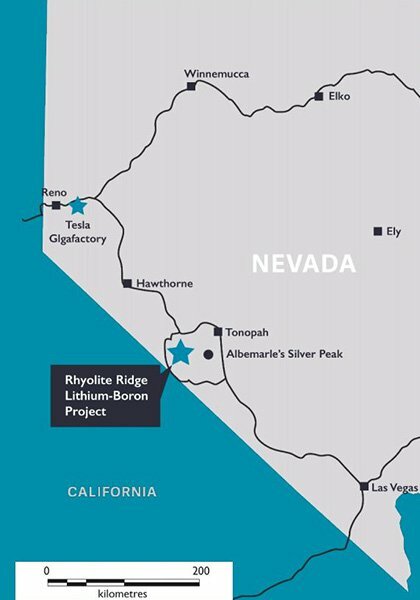 Rhyolite Ridge is just 25km west of Albemarle’s Silver Peak lithium brine mine and has the potential to be a strategic, long-life, low-cost and reliable source of lithium, boron and potassium. 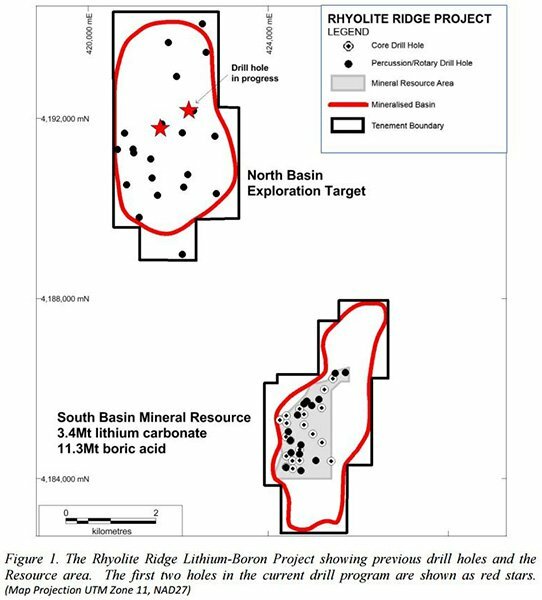 The company is drilling two holes at its North Basin where drilling in the 1980s identified a thick, shallow and extensive zone of lithium-boron mineralisation, before drilling further holes in the overall project. For those who don’t know much about boron, it is a commonly used, high value chemical element, and its uses mean it’s not one to go in and out of vogue. Thus, it represents a more stable side of this company’s development equation. It’s not a particularly high-profile commodity even though it’s been mined for decades. Its common applications include borosilicate glasses used in cookware, fibreglass, ceramics, fertilisers and detergents. This company is looking at lithium to provide the ‘boom’ to a more stable boron buffer, especially as it aims to join the big four companies producing 85% of world supply. Considering the need for lithium in new technologies, particularly electric vehicles (EV) and other battery-powered devices (the lithium ion market is expected to quadruple by 2020), lithium is starting to look more and more like a 21 st century mainstay. 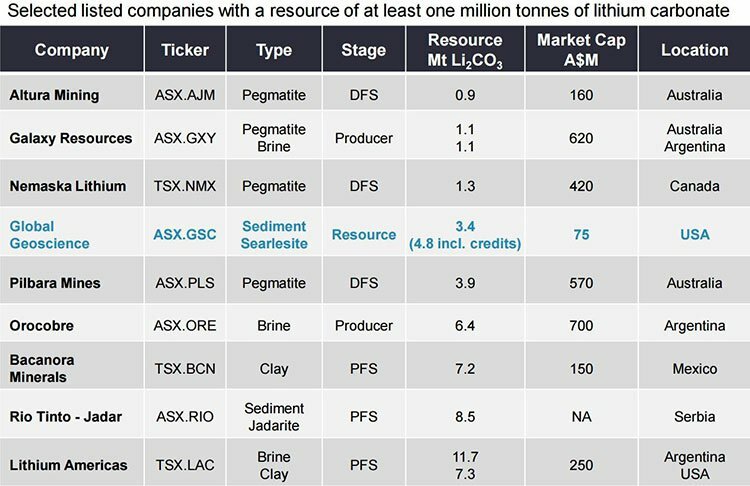 And with only one lithium mine currently in production in the US, this $75M capped ASX lithium stock could soon be in elite company. In the coming weeks, this company will be announcing results of its metallurgical test work and drill results. This work should put it on track to determine whether the lithium and boron bearing minerals can be concentrated and then liberated through the acid leaching process. But we’ll delve into that side of things a bit later. 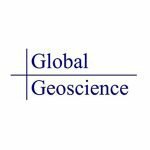 Global Geoscience (ASX: GSC) has its hands on several prospective holdings – but its main focus is its Rhyolite Ridge lithium-boron project. The project is a high-grade lithium/boron searlesite deposit, and GSC will shortly exercise its option to own 100% interest of the project. You can see highlighted in the column to the right the stark difference in market cap between GSC and its competitors. But at the same time, you have a company with $5M in cash, a JORC Resource, prospective holdings in an ideal location for off-take deals, and a potentially inexpensive means of production. All of which puts it ahead of most other mining small caps in the lithium market. The company could be looking at a mine with a potential life of greater than 20 years, which, if current estimations are accurate, could be producing 20,000 tonnes of lithium carbonate per annum – or about 10% of world demand for lithium. The company acquired an extensive exploration database soon after securing the project. Much of this data was never disclosed, until now. As GSC carries out further in-depth analysis of the data and kicks off its maiden drilling program, we could see a lot of news flow, potentially converting into share price catalysts in the near future. It should be noted that any share price catalysts are speculation at this stage and investors should take a cautious approach to any investment decision they make in this stock. Searlesite – what’s the big deal? GSC is confident about what it has, and a big part of that is the fact that Rhyolite Ridge is a zone that’s both high in lithium as well as boron associated with the mineral searlesite, and consequently the mineralisation is leachable with dilute sulphuric acid. That’s the main basis of GSC’s play here – the low cost, quick and simple technique for processing of these high value resources when found in searlesite, a sodium boro-silicate mineral. To give you a bit more information on the searlesite mineralisation – it is amenable to upgrading by crushing, screening and flotation and is leachable with weak acid as opposed to a clay deposit which requires high cost roasting to extract the lithium from the clay. Searlesite presents as a coarser-grain than clay deposits which makes it attractive for concentrating the lithium and boron bearing minerals. GSC’s discovery last month of the searlesite rich zone found in a part of the Rhyolite Ridge deposit containing high value mineralisation is certainly good news, and bodes well for this company’s particular angle on lithium. 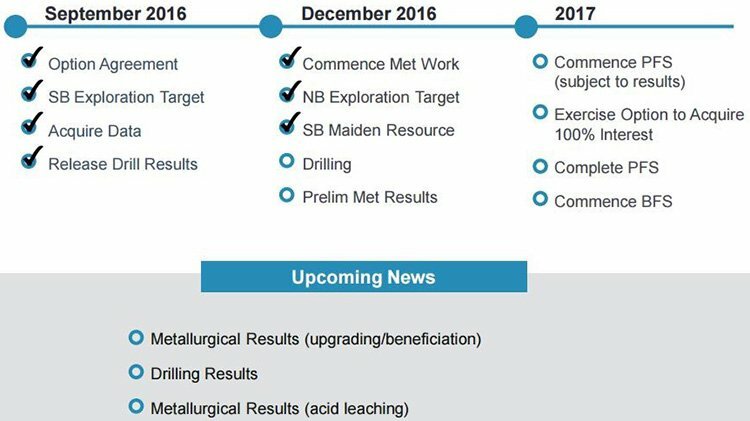 Metallurgical testing should generate news flow in the coming weeks... and it’s going to be a key step on the journey for GSC. Testing will involve: crushing and screening to determine if waste minerals can be separated without significant loss of lithium/boron; flotation and other methods to determine if lithium/boron-bearing minerals can be separated from gangue minerals including acid consuming minerals such as calcite; and acid leaching of the lithium-boron concentrate to determine recovery levels. This stage is all about GSC testing how much of the lithium and boron can be extracted by low-cost processing methods. GSC has commenced drilling at Rhyolite Rydge this week, targeting searlesite-type lithium boron mineralisation of the same type that makes up the high grade Searlesite Zone within the current South Basin Resource. The first two holes will twin holes drilled in the 1980s by US Borax (Rio Tinto), which identified a thick, shallow and extensive zone of lithium-boron mineralisation. The North Basin is not included in the current JORC resource and could expand this play even further. Following these two holes, a minimum two holes at South Basin will be drilled, targeting extensions to the Searlesite Zone. This maiden drill program is targeting high grade Li-B searlesite mineralisation because it represents the high value material within the deposit and the lowest cost option to process and produce lithium carbonate and boric acid. Remember, the company has already defined a maiden JORC Resource here, so the company is one step ahead of the game. Samples will be included in metallurgical test work that is already underway at laboratories in Denver, Colorado and Ontario, Canada. As we mentioned earlier, the main ore mineral is searlesite, a sodium boro-silicate mineral, which sets it apart from other hard rock sources of lithium (pegmatite and clay) which require roasting in order to produce the end product, lithium carbonate. 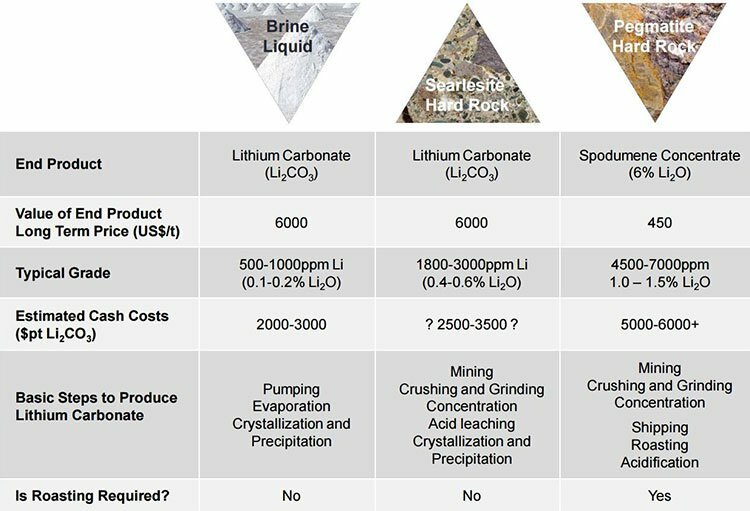 Because the lithium and boron are associated with searlesite, GSC’s extraction could be done through cost effective acid leaching, rather than roasting – which could enable the company to beat most of the world’s hard rock suppliers on cost. Add in the fact that the value of the contained boron is similar to that of the lithium, this company could be producing lithium at a very low net cost. The project site was explored for lithium in 2010-11 by JOGMEC (a Japanese Government funded company), who completed 36 drill holes, a useful bit of preliminary work that GSC can tick off the list. JOGMEC focused on the lithium rather than the boron and so missed a crucial part to this play. The company believes the project has significant potential as a strategic, long-life and low-cost source of lithium, boron, and as an added extra, potassium. Last month, the company announced the discovery of a high grade Searlesite Zone at Rhyolite Ridge. 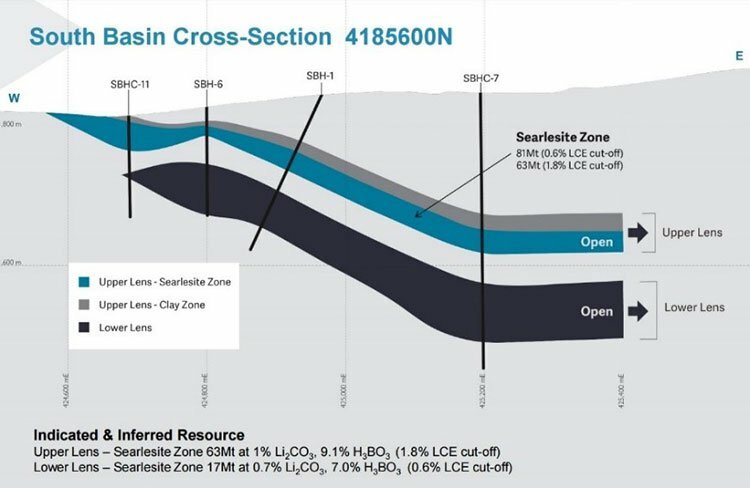 The findings indicate that the Searlesite Zone accounts for 97% of the high-grade component of the South Basin Resource, with 65 million tonnes at 2.0% lithium carbonate equivalent grade and containing 650Kt of lithium carbonate, 5.9Mt boric acid and 1.4Mt of potassium sulphate. As these key milestones are ticked off from the to-do list, GSC will not only provide its own self-sourced news, it’s likely to gain some media attention. Why? Well, there’s currently only one lithium mine in production in the US. So... considering Tesla – the billion dollar manufacturer championing the global shift from fossil fuel powered cars to electric – is based in the US, and has its own goals for low-carbon sourcing of materials (domestic)... and relies heavily on lithium for its batteries... means we could expect some serious news flow to come from GSC in 2017 as development continues. Especially as metallurgical testing progresses. GSC could certainly be media worthy not just for its uniqueness as a searlesite play – it’s that Tesla’s Gigafactory is in the same state as GSC’s Ryholite Ridge project. Only a couple hours’ drive (340km) away, in a Tesla Model S.
As mentioned earlier, a comprehensive exploration database has provided GSC with a way to fast-track project development through to a PFS. It includes data compiled from 8800m of RC and diamond drilling at the site’s South Basin in 2010-2011. GSC estimates it would cost over AU$3M today to replicate all of the historic work that has been undertaken at the South Basin. That’s a pretty substantial time and cost saving for GSC at a critical, cash flow sensitive time like this. In the next few months, it should become apparent how much of this mineralisation will be extractable within budget, for a profit, as testing reveals what can and can’t be done to liberate the lithium and boron from the searlesite rock. One point to keep in mind with this mining hopeful is the fact that nobody else is doing quite what GSC is trying to do. The company has one of the largest lithium and boron deposits in the US; in fact, there are no other comparable deposits in North America . Combined with the proposed method of extraction, it’s a distinguishing feature of GSC’s business plan. Perhaps that’s just what the voracious lithium-ion battery market in the US needs as demand continues to rise in line with the transition from fossil fuel to electric power. Being a two-pronged play (lithium-boron with maybe a bit of potassium on the side), proposing a unique advantage of a cheap, simple process of extraction – weak acid leaching – GSC could be in for fatter profit margins, and the chance to become one of the major lithium suppliers in the world. The difference between it and other juniors, if all goes to plan, will be its ability to process cheaply and deliver quickly to a keen domestic market. GSC is still in the early stages of this gameplan, so investors should seek professional financial advice for further information if considering this stock for their portfolio. There are only a few key variables that the company’s Rhyolite Ridge project is riding on – as opposed to projects with compounding geo-political, environmental or native land rights complications or where international shipping needs to be factored in. Rather, it’s located in a mining-friendly state in a lithium-consuming country. 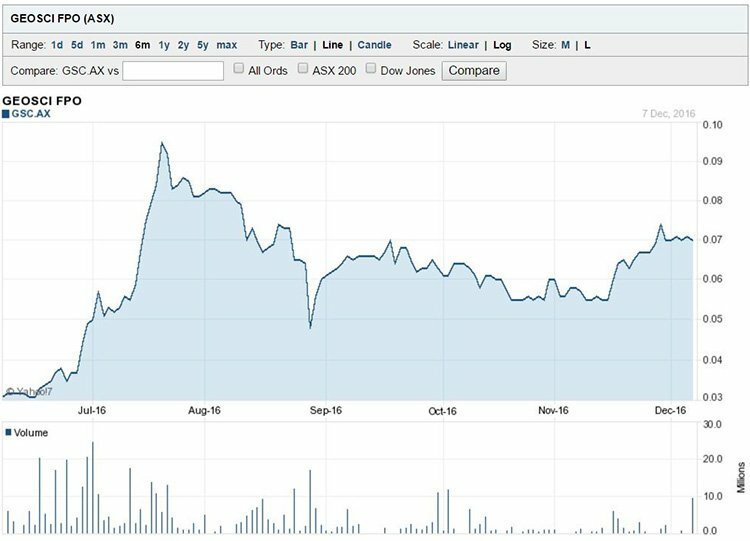 In August, GSC raised AU$6M in a heavily oversubscribed share placement , giving it the cash backing it needs to see Rhyolite Ridge through to a pre-feasibility study (PFS). The capital was raised via international and domestic institutional and sophisticated investors, a mix of new and existing, driven by the upsurge in interest around Rhyolite Ridge. In more detail, this $6M will go towards metallurgical testing, resource and the current exploration drilling program, maiden JORC-compliant resource estimate at the site’s South Basin, a pre-feasibility study as well as general corporate and working capital purposes. With recent funding, GSC is positioned well to begin down the path of a PFS sooner rather than later... that, and the company’s additional current drilling, points to the company’s ideal of achieving a far tighter lead time to production than its lithium mining competitors. Once the metallurgical testing results are all in, and assuming there are no major surprises there, GSC will likely look to exercise their option to own 100% of the Rhyolite Ridge site as their first point of call. With a JORC-compliant Maiden Resource already completed for the project, drilling and metallurgical test work underway, and now a fully funded PFS on the schedule for commencement in early 2017, now could mark the dawn of GSC’s transition from small cap speculative stock to global lithium/boron supplier. 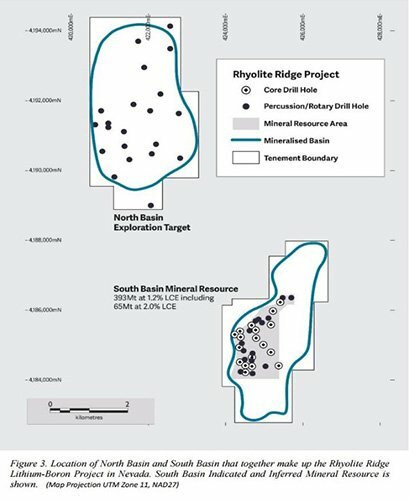 Rhyolite Ridge could well have the potential to be a low-cost open-pit mine, with a simple process route to producing lithium carbonate and boric acid on-site, and a potentially favourable profit margin when compared with typical lithium processing that requires roasting and higher-cost extraction options. There’s still some steps to go for GSC, but all signs currently point to ‘promising’ for the budding lithium-boron play.